As a story that is mediated by technology, screens form the lens through which Ridley Scott's award winning drama unfolds. The Martian tells the story of NASA’s efforts to bring stranded astronaut Mark Watney home. Based on Andy Weir’s novel, the story is set circa 20 years in the future, during NASA’s third manned mission to Mars. 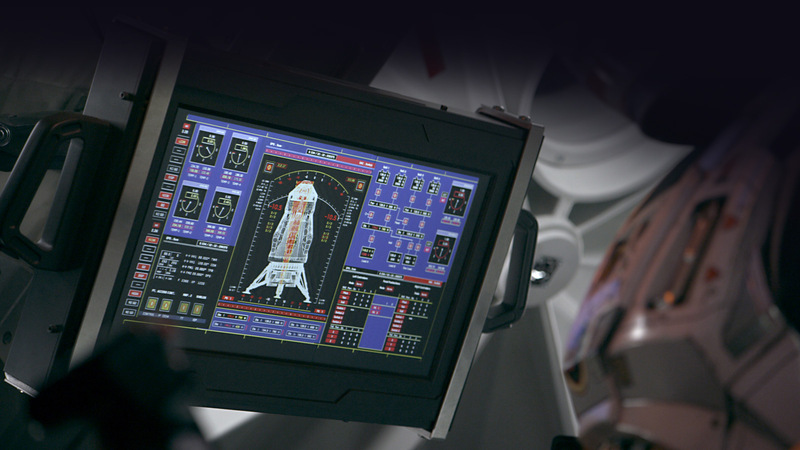 Predicated on real science, Director Ridley Scott and Production Designer Arthur Max drew on the expertise of specialists at NASA and the European Space Agency, and asked Territory to craft the screen graphics and UI that would be needed to support the script and action. 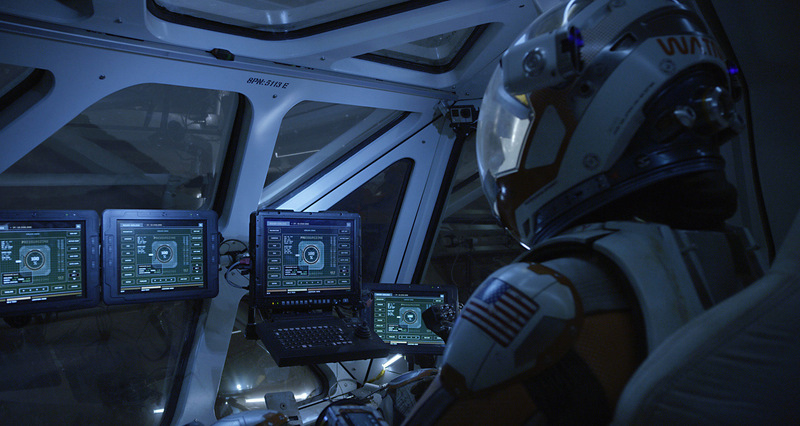 NASA MISSION Control was the biggest set and featured around 100 screens, including a bank of LED monitors 18m x 6m. 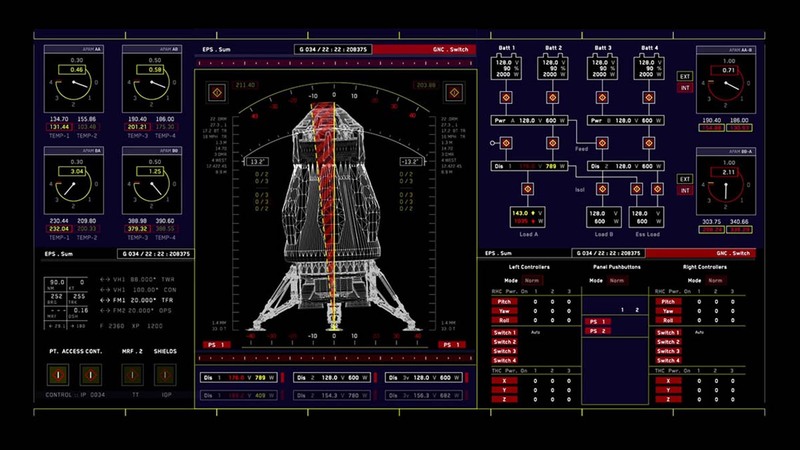 The brief for the Mission Control screens, including NASA and JPL, was to keep things looking real. 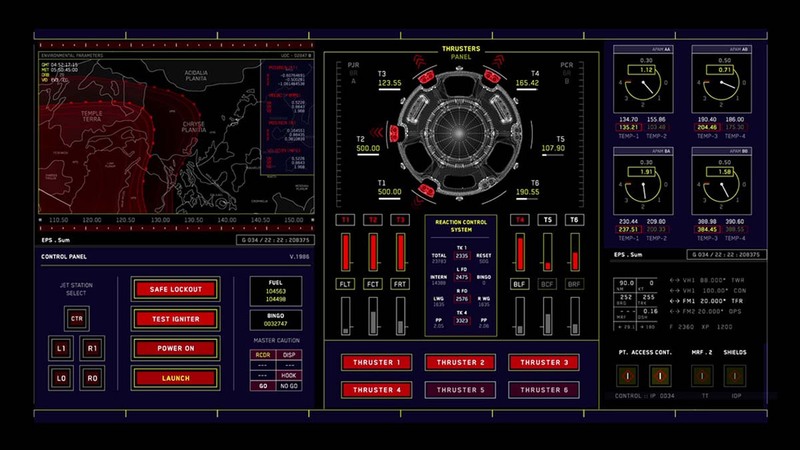 One of the film’s key scenes plays out in NASA Mission Control so it was essential that we got the balance right between factual screen content and visual design. Each screen has a real purpose in that context and we needed to make sure that we reflected that in the design detail. 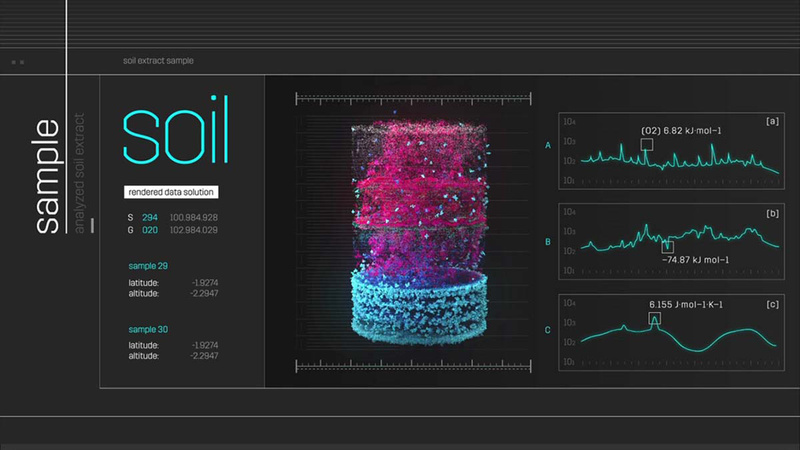 And, it was important to give a unique identity to the set, which features a lot of information, including realistic video feeds and telemetry data that the actors react to and interact with. A number of scenes required real satellite images of Mars that showed the Hab (habitat), weather and terrain. We created these in 3D, basing the geography on satellite images that NASA provided for reference and fictitious elements on set, prop and vehicle design. 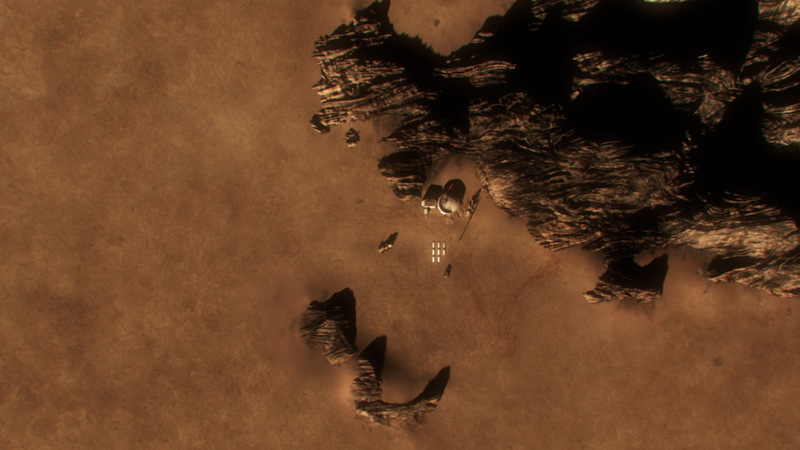 The HABitat facility on Mars provided an opportunity to be a bit less data driven in our interface design. The white environment is reminiscent of a research facility, so we adopted a more modernist look and feel to the visual language of the graphic displays. The bright white and blue typography against a dark grey background played well on-set and contributed a balance of advance tech with clearly recognizable data streams. Factual accuracy was key, so our designs were absolutely true to the original Pathfinder systems, which NASA gave us references for. We ended up reproducing the actual way the images were decrypted in some of the key scenes, in which Mark Watney (played by Matt Damon) is using the camera to communicate with Earth. A great set to work on, the Hermes needed to suggest an advanced avionic interface and we were asked to come up with a twist on current thinking. To get a sense of the latest interface design in spacecraft R&D, we looked at NASA’s own projects, some in development, others still conceptual, and we looked at how SpaceX are designing their consoles. Out of the routes we presented, Arthur Max felt that this bright blue, green and white palette against a black background, with a clear grid structure to the data displays presented a good balance between authentic data, visual impact and a more contemporary avionic interface. 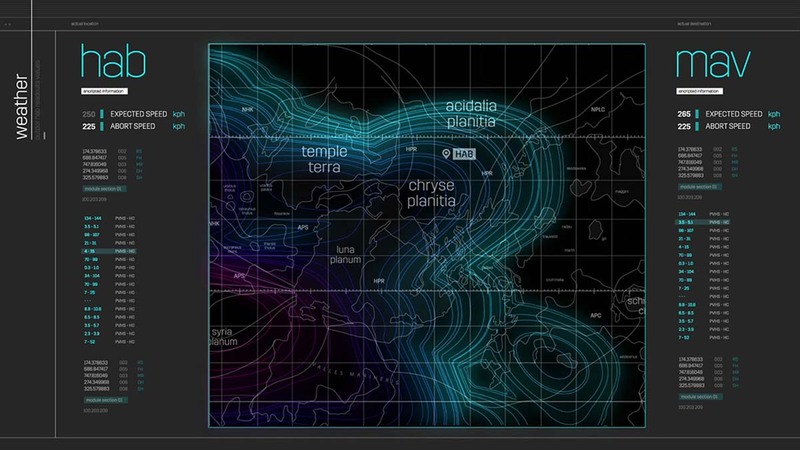 Territory delivered around 400 screens for on-set playback, most of them featuring interactive elements. 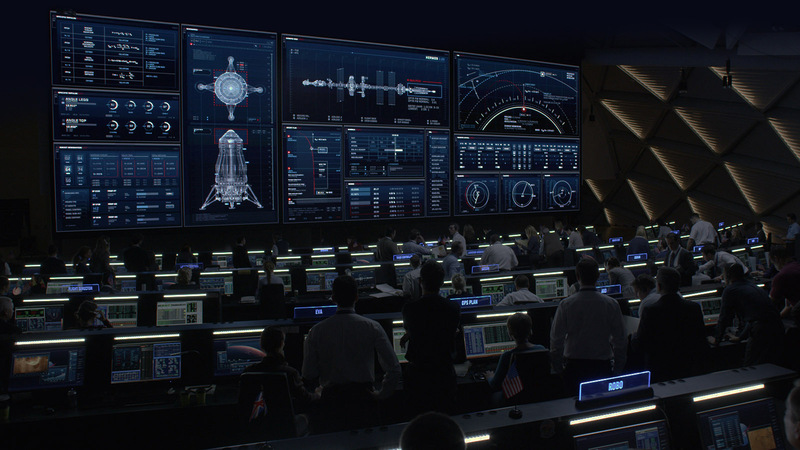 With 100 screens on the NASA Mission Control set alone, a number of which were 6mx18m wall screens, there are many moments in which the graphics become a dynamic bridge between Earth and Mars, narrative and action, audience and characters. 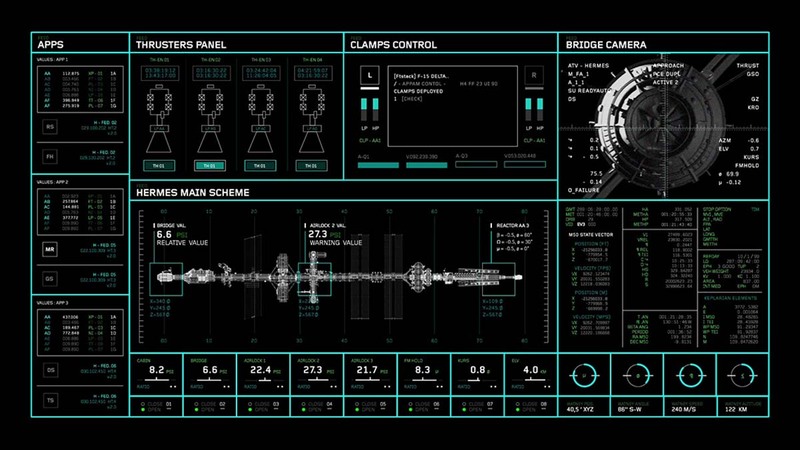 Intended to primarily display biometric data about the crew members, gave us a limited data set to work with. 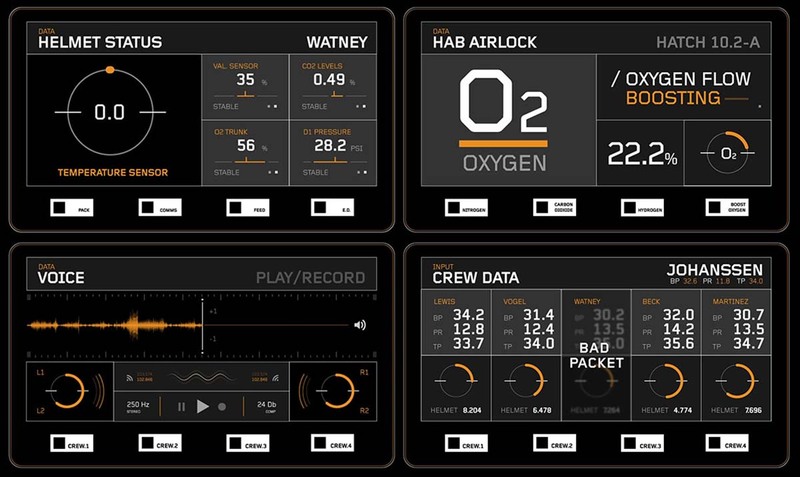 As the interface needed to be easily read through a helmet, we designed very clear simple displays with white and orange data against a black screen. 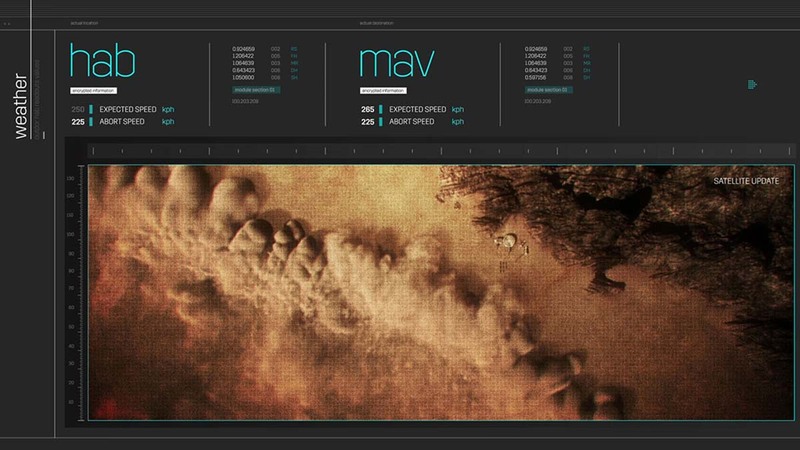 The visual language of the M.A.V. was an interesting challenge. 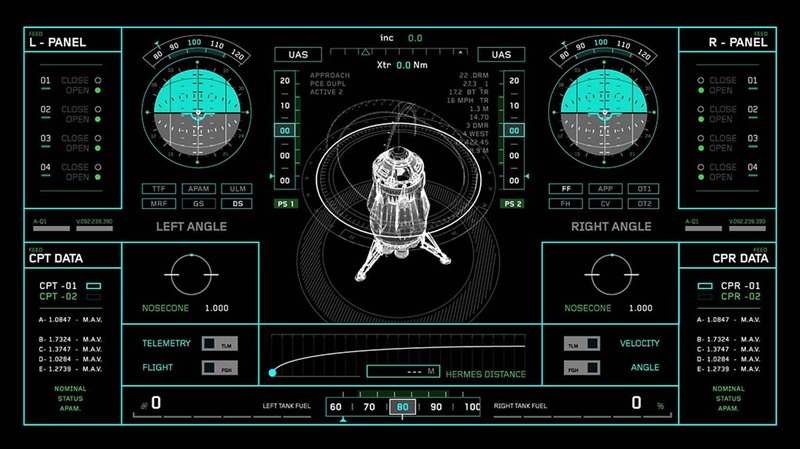 As a dedicated ascent vehicle, it really has a limited function that defines the data on the screens. M.A.Vs are featured in two key scenes at the beginning and end, and there is a lot of dramatic tension tied into them. 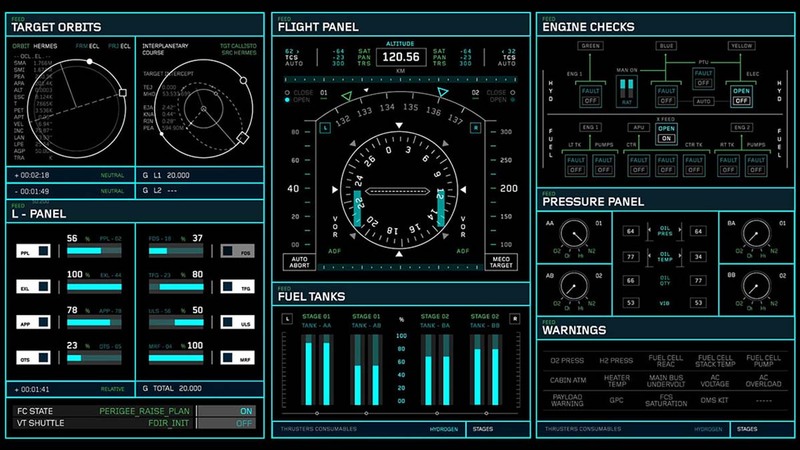 We designed the graphic interfaces for maximum visibility, not just because the crew wear helmets but because it is a busy environment with a lot going on. 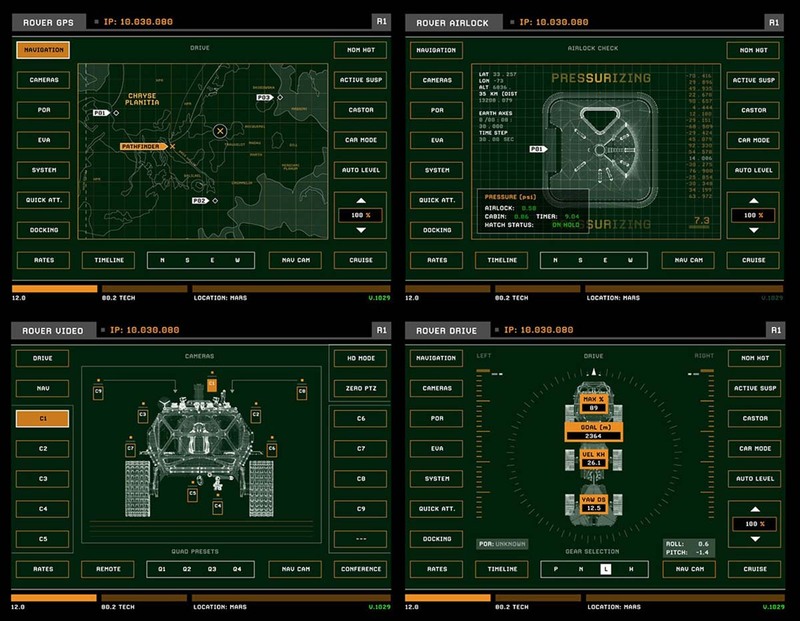 Referencing the organization and data streams of JPL’s new Orion Rovers, we added a pared down utilitarian functionality to the interface design.